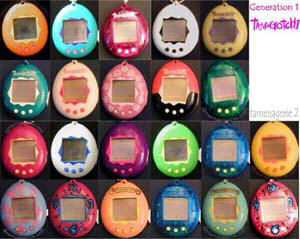 The original Tamagotchi was released in Japan in 1996 and later in the United States and Europe in 1997. It originally came in six different colours then was later released in a different bunch of colour. The difference between the Generation 1 and Generation 2 Tamagotchi is the game that your little tam plays and the physical background. The game on the first generation is to guess which way it's going to look. The Gen2 game is a higher/lower number guessing game. The background on these is a checkerboard pattern. The Gen2's also have a wavy background graphic. The first icon is the Status bar. This includes information such as Hunger and Happiness, age, and weight as well as the discipline meter. This is how you find out if you need to feed your character food, or play a game/feed a snack to/with it. The second is the light icon. This is used when your character is sleeping and you have to manually turn the light off it. By not turning the light off this can be classed as a car miss and effect what character it will eventually evolve into. The third icon is for playing a game with your character. The game is a left or right game. Your character will stand in the centre of the screen and will switch between facing left or right and you have to guess what way it will face. You choose what way by pressing A for left, and B for right. It is a matter of chance if you win the game as there is no guarantee that you will win the game each time you play it. Medicine is the fourth icon and is used when your Tamagotchi become sick. It can become sick shortly before changing and sometimes before it dies. A skull will appear by their head when they are ill. They will also refuse to play a game and each food. You then have a to give a few shots of medication and it will eventually become better. Once the medication has been taken, you will be able to continue all normal features such as playing games etc. The toilet icon is for use when your character has pooped on the screen. It regularly goes for poops throughout the day and you have to clean them up. Not cleaning them up is a care miss and if you let your character sleep with poop next to them it will also effect what it evolves into. Leaving more than one poop on the screen can also cause your character to become ill and eventual if left long enough die. The next icon is used to tell you when you need to feed the character either a meal or a snack in order to fill the Hunger bar or the Happiness bar. Each meal that you feed the character adds 1lb to its weight. Snacks add 2lb but also raise the Happiness bar. A slice of bread is the food on the international version (US, European etc.) and the Japanese versions have a bowl of rice or food and a piece of Candy in a wrapper. When your Tamagotchi character has been naughty and will refuse to play a game and sometimes refuse to eat food/play a game it needs to be disciplined. You click this icon and it will add a few bar’s to your discipline metre that is found in the status bar. By disciplining your character you will get a better character. This is the Hong Kong Commerative edition Tamagotchi. It is some what rare, though not impossible to find. There were 10,000 made. The third row are the first six colors released in the US. To commemorate the April 1 expansion of Japan Airlines' Mileage Bank (JMB) frequent flier programme to include domestic flight mileage awards to JMB members in Japan, JAL will be offering 30,000 'JAL Original Tamagotch Presents' in a three-month campaign in Japan from April 1 through June 30. 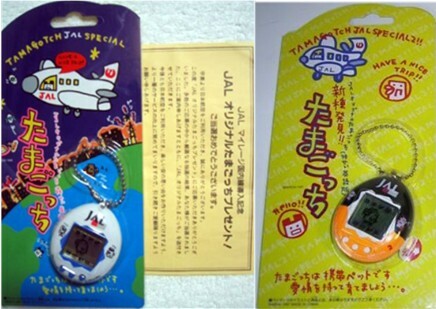 The 'JAL Original Tamagotch Present' has English programmed software in an egg-shaped case bearing the JAL logo. From April until the end of June, JAL cabin attendants will distribute postcards to passengers on domestic flights for a monthly draw offering 10,000 lucky travellers a chance to win one of the coveted 'tamagotch' presents. The electronic 'tamagotch' is safe to travel in an airplane but owners of the trendy toy will be requested not to play with it at take-off and landing. The white is a first generation. The orange and black is a second generation. I don't know the story behind the second one.